Received February 21, 2017; Accepted February 23, 2017.; Published online February 27, 2017. Fig. 1. When cells are insulted by DNA-damaging agents, p53 is phosphorylated and acetylated, such as by Chk1 and p300, respectively, resulting in its dissociation from MDM2 and stabilization. The stabilized p53 is then conjugated by ISG15 and this modification increases phosphorylation (pink circle: P) and acetylation (blue circle: A) of p53 and in turn in its ability to bind p53RE for the expression of ISG15, its conjugating system (E1–3), and other targets, including p21 and BAX, as well as itself. This increased expression of ISG15 and E1–3 further accelerates p53 ISGylation and subsequent processes for suppression of cell growth and tumor development by forming a positive feedback loop. When this loop is no longer necessary, UBP43 is induced and deISGylates p53 for destabilization. Fig. 2. 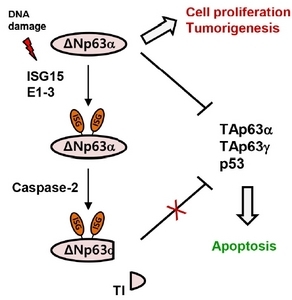 DNA damage induces ISGylation of ΔNp63α, which leads to caspase-2-mediated cleavage and release of the C-terminal TI domain. The cleaved ΔNp63α no longer can inhibit the transcriptional activities of the p53 family members, thus allowing their apoptotic functions. Fig. 3. Under normal conditions, PCNA serves as processivity factor for replicative DNA synthesis. Upon DNA damage by UV, PCNA is mono-ubiquitinated by the RAD6/RAD18 E3 complex for tethering Polη for TLS. After bypassing DNA lesions, EFP generates ISGylated PCNA for recruiting USP10 and thereby for elimination of ubiquitin and release of Polη from PCNA. EFP then produces doubly ISGylated PCNA, likely for blocking unnecessary mono-ubiquitination of PCNA. Finally, UBP43 removes both ISG15 molecules for reloading replicative DNA polymerases and thereby for resuming normal DNA replication.